I completely agree with their conclusions. Muffins are heartier, often with bits of fruit or nuts and much denser - especially if, when you eat muffins, you tend to go for fiber blueberry or peach raspberry, like me. 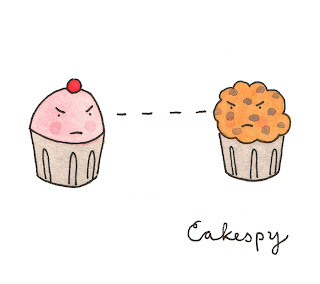 Both have bits of fruit that could potentially lend themselves towards being a cupcake, but who's ever heard of a fiber cupcake?! Nobody. Also, I agree with Cakespy that frosting is a key deciding factor. As Cakespy pointed out, cupcakes always have frosting. Frosting makes them special, makes them cute, and makes them delicious. Muffins, on the other hand, do not have frosting. The line is slightly blurred when you have a muffin with that lemony, creamy glaze topping, but I think those are hybrids. My bet is that either the baker who makes glazed muffins for your favorite coffee shop goes home and night and makes cupcakes OR the glazed muffin maker knows their muffins are subpar so they put the glaze on in an attempt to make up for shortcomings. One last thing it is important to note, however, is that a cupcake without frosting ISN'T a muffin. It's a lamecake. A big, caloric "why bother". cupcakes might have frosting, but muffins have TOPS. if you can't tell, i'm a muffinman (so many jokes, so little time). went to a bakery for breakfast yesterday and a pumpkin muffin caught my eye. it was love at first sight. i had already placed my order, but i got back in line, waited my turn and eventually bought her and took her back to my table. we flirted a bit, i nibbled on her and then i couldn't handle it any longer so i opened wide and introduced her to my esophagus. It's a time thing too, though. You mentioned you had a muffin for breakfast. That makes sense. Cupcakes are too sugary for the morning. Muffins can be too bland for the afternoon (unless they are glazed, perhaps). It's like coffee and tea. Coffee in the am, tea in the pm. Muffins in the morning, cupcakes in the pm. Any you can't deny that cupcakes are always cuter. i'll grant you that cupcakes are usually cuter than muffins. that is, unless i'm baking blueberry or pumpkin chocolate chip muffins, wherein i put smiley faces on the tops with blueberries or chocolate chips.